Death his religion--blood his lust! You’ll find a lot of contempt running through the films of Andy Milligan. Perhaps it was due to his unhappy childhood and his troubled personal life, but his films were full of hateful, vicious people doing hateful, vicious things to each other. 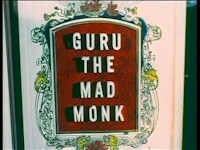 Guru, The Mad Monk has all this and more--in fact, it reveals that Milligan also had a contempt for conventional storytelling and filmmaking altogether, as you almost want to believe that his films were the work of some deranged genius who knew exactly what he was doing. After all, he actually had a legitimate background in art due to his participation in the off-Broadway scene of the 50s, and he took whatever he learned and tinkered with there and moved it in front of a 16mm camera, where he proceeded to tear it all down and rip it apart in sub-grindhouse productions like this one. Like many of his films, Guru is a period piece, though you’d hardly know it if you weren’t already aware. Set on the fictional island of Mortavia (actually Milligan’s native Manhattan), it revolves around a 15th century penal colony that’s lorded over by the corrupt title character (Neil Flanagan). Assisted by his hunchback, Igor (Jack Spencer), he doles out punishment as he sees fit and often executes those he finds to be unseemly. Fair warning--most of this comes across rather crudely and doesn’t make much sense until a last-ditch exposition dump arrives in the form of a couple of priests who have come to replace Guru, who, as you may have deduced is quite insane. Until that point, the film’s threadbare through-line involves a young girl (Judith Israel) that got knocked up by a gypsy and gave birth to a stillborn, a transgression for which she was arrested; her lover (Paul Lieber) appeals to the mad monk on her behalf, and he enlists him in some convoluted plot involving magic sleeping potions and stolen corpses from a local medical school. It’s like Romeo and Juliet meets Frankenstein meets brain damage, as it’s all an elaborate run-around that also involves one of Guru’s assistants (Jacqueline Webb) who needs blood because she’s a vampire. Meanwhile, Israel stays locked up in a tower and constantly points out that visitors often enter but do not leave Guru’s church. With a mouthful like that, one hast to think that Milligan is thoroughly dispensing with coherence and narrative structure. A lot of these characters just come and go, especially Lieber, who is seemingly set up as the film’s protagonist set to wrangle with the moral quandary of making a Faustian deal with a psychopath. But no--Flanagan presides over the film as its deranged central presence, and I’ll be damned if it doesn’t make sense in the end, as, beneath the tangly plot veneer, this is just a delightfully deranged exploitation movie. It’s both thoroughly convincing and unconvincing all at once--there’s no mistaking the setting as anything but 70s New York, between the feathered hairdos and Lieber’s Bronx-inflected speech pattern, and you’ll often see and hear the intrusion of modern fixtures like light switches and the sound of ambient traffic. Though Milligan often borrowed actors from his drama background, it didn’t always work out; Lieber is a case in point, as he can’t even look convincing while standing around, and Israel is similarly woeful. There’s a real community theater vibe, as the production is modestly dressed in amateur costumes and set design. Still, the film manages to occasionally transcend these trappings, particularly in the performances from Webb and Flanagan. The latter is a commanding presence who is prone to arguing with himself in a mirror, as part of his mind has given way to someone he may or may not have actually killed at some point. Guru is quite a character, indeed, who delivers theatrical levels of cruelty in the form of eye gougings and cross-brandings like some kind of coked-up Torquemada figure. 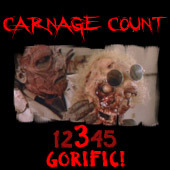 His outrageous cruelty is only matched by the outrageous crudeness of it all, as the gore and makeup effects are probably the most technically impressive aspects of the production, and even these are supremely lo-fi and done no favors by Milligan’s imprecise and claustrophobic framing (which was often employed to compensate for the obvious lack of period dressing). Milligan’s films aren’t just ugly--they’re downright hideous, drenched in grit, grime, and hatefulness. All of this especially clashes with the intended high romance and fantasy vibe of Guru; at its core, the film is really a story of a girl in a tower looking to be rescued by her prince charming. It just so happens that prince charming might actually end up on the business end of a noose, a dagger, or worse. Despite its obvious myriad flaws, Guru works--maybe because it’s a solid, concentrated 58 minute blast--and it’s difficult to deny Milligan’s auteurist stamp. Say what you want about him, but you likely know an Andy Milligan film when you see it, and this is no exception. His style helped to define this particular subset of American drive-in filmmaking--the really grungy, proto-grindhouse stuff that made Herschel Gordon Lewis seem accessible by comparison. Guys like Milligan are the direct antecedent to the do-it-yourself, self-styled schlock auteurs that would emerge in the coming decades, and his work is one of a unique, singular voice that is difficult to ignore, if only because it screeches with an angry whine. Guru is perhaps the best film I’ve seen of his (and I’ve only seen a handful), and it’s been released on DVD a few times. Retromedia’s done the honors twice, and it’s popped up on a Mill Creek set called Pure Terror; all three seem to be sourced from the same beat-up, filthy print that still manages to be vibrant and colorful (an interesting contradiction that’s true of many of this era’s films--so many were ugly but colorfully so). If you’re looking for an entry point into the wild, weird world of Milligan, this is as good as any. Rent it!